Uillinn: West Cork Arts Centre is a purpose-built building for the arts in West Cork. it comprises two contemporary galleries, three artists' studios, a work space, a multi-purpose dance/performance/film/lecture space,café, courtyard and office space. 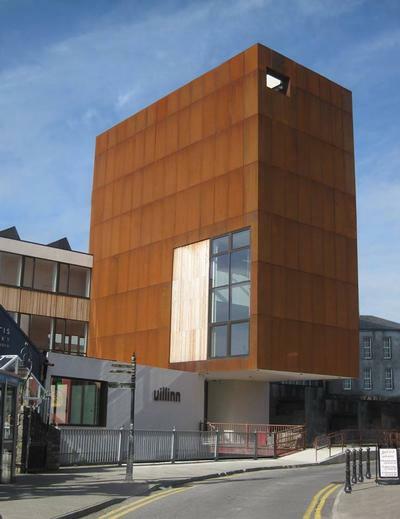 In January 2015 we moved to our new building Uillin: West Cork Arts Centre a purpose-built building for the arts in West Cork. Uillinn was officially opened by President Michael D. Higgins on 11 June 2015. A full exhibition programme running throughout the year comprises work by local, national and internationally artists. Currently WCAC provides a range of education and community programmes for adults and children at the Centre in Skibbereen and throughout the West Cork region. The unique and enriching opportunity to experience and work with real artworks and live artists is explored through many of its programmes. West Cork Arts Centre places education at the heart of its activities with a wide range of arts workshops, community-based projects, film screenings, seminars, talks and gallery tours on offer throughout the year.